4K TV shows aren’t yet a reality in most countries, but Sharp has announced a unit that can receive and record them. 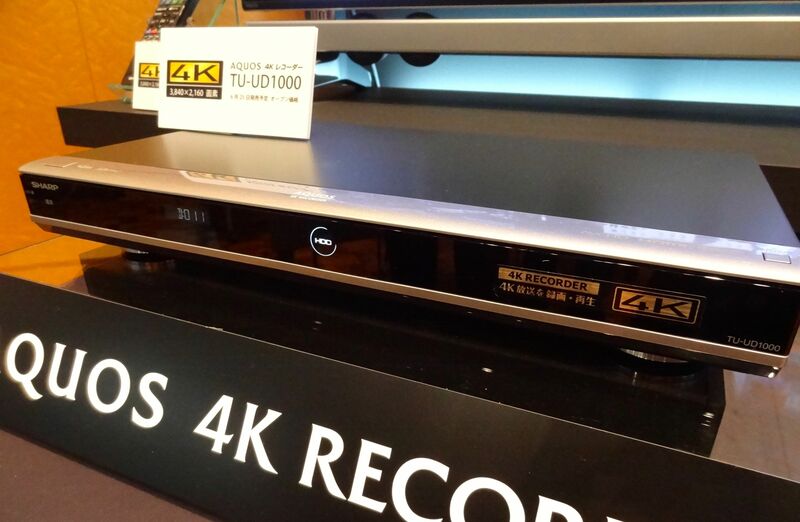 To coincide with trial 4K TV broadcasts that begin next month in Japan, the Aquos TU-UD1000 is the industry’s first 4K TV recording and playback device, according to the company. It will go on sale in Japan on June 25 for about ¥120,000 ($1,183). 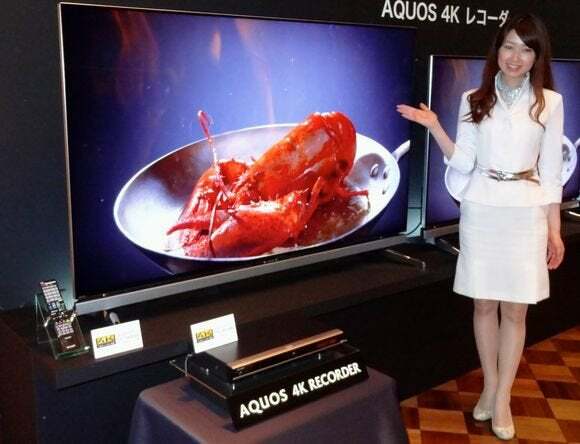 Sharp's Aquos 4K TU-UD1000 recorder and Aquos LC-70UD20 4K TV are shown off at a press event in Tokyo. Overseas sales have not been decided yet due to the lack of 4K programming. Demand for the technology is expected, however, as major content companies in the U.S. and U.K. such as YouTube, Netflix and British Sky Broadcasting (BSkyB) have been experimenting with 4K content. The TU-UD1000 unit will have a hard disk recording capacity of 1TB, which means it will be able to store about 53 hours of 4K TV shows under the trial broadcasting system. Sharp also announced three Aquos UD20 series LCD 4K TVs, in 70-, 60- and 52-inch sizes, that require the TU-UD1000 to view and record satellite 4K programs. The TVs will be priced at ¥430,000 to ¥700,000 and will go on sale in late June and mid-July. Also known as Ultra HD, 4K TVs have four times the pixel resolution of standard high-definition TV sets. They have often been shown off at consumer electronics shows such as CES in recent years. About 500,000 4K TVs are expected to sell in the U.S. in 2014, according to the Consumer Electronics Association (CEA). In the absence of 4K TV broadcasts or 4K video, however, 4K TVs have upscaled incoming 3-D or 2-D signals to project a 4K-resolution image. Test broadcasts of 4K TV shows in Japan are scheduled to begin June 2 under a television consortium called the Next Generation Television & Broadcasting Promotion Forum (NexTV-F). Sony, a member of NexTV-F, will record some 2014 World Cup matches starting next month. In October, NTT Plala, part of the giant NTT telecommunications group, will launch a 4K video-on-demand service under its Hikari TV brand. When hooked up to that service via the Internet and LAN cable, the UD20 TVs will be able to display 4K content without the external recorder. Sharp previously announced 4K TVs without receiver functions for markets in the U.S. and Asia, including the Aquos 4K Ultra HD, unveiled at CES in January.